Write a PHP script to redirect a user to a different page. header() is used to send a raw HTTP header. replace: The optional replace parameter indicates whether the header should replace a previous similar header, or add a second header of the same type. http_response_code: Forces the HTTP response code to the specified value. Note that this parameter only has an effect if the header is not empty. 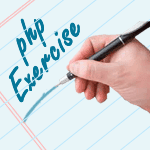 Previous: Write a PHP script, to check whether the page is called from 'https' or 'http'. Next: Write a simple PHP program to check that emails are valid.